Do you have extra space and love to share with a homeless pet? Then become a foster home! There is a tremendous need for foster homes. It is a very rewarding experience that helps homeless pets on their journey to find forever homes. Rescue groups and shelters rely on foster homes as a way to increase the number of pets they can save. 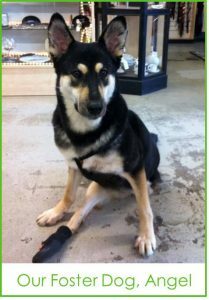 The experience will touch your heart – we know, as Riley was our foster and he never left! Foster homes provide a loving environment to scared, shy, and healthy pets. Sometimes the pets just need extra love and TLC to gain the trust of people – but for many of the pets, they just need a place to stay temporarily until their forever home is found. We know how hard it can be to see your foster go into a loving home, as it doesn’t take long to fall in love with them. 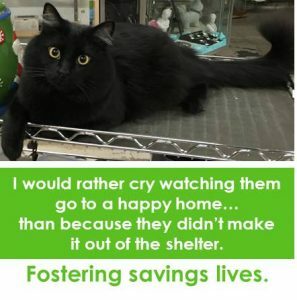 It is such a rewarding experience to know you have helped save their lives and allows you the opportunity to share your life with many dogs and cats that otherwise would never touch your heart. Contact your favorite rescue group today to see how you can help – or visit our Find a Rescue or Shelter or our Groups Needing Fosters pages. Or, come into our store and talk to us – we are very passionate about foster programs. We challenge everyone reading this to foster just once! If it’s not for you…at least a life was saved. How do you let your foster go to a new home? Don’t you get attached? them, it is more rewarding to receive updates and hear that they are doing wonderful in their new home. We know that our role is bigger – when our fosters are adopted, that means we can open our hearts to other deserving animals. We are a pit stop on their journey of love. And seeing updates of them happy in their new homes is incredibly rewarding. While we say goodbye to one foster, we open our hearts to another foster who needs extra love before finding her forever home. What kind of things do I have to do for the foster pet? Most rescue organizations do not have a shelter, so they rely on foster homes. Your main responsibility as a foster is to take care of the pet until they find their forever home. Most organizations will pay for the food, vet care and all incidentals – you just provide the love and care. What types of fosters are needed? There are many types of fosters needed….through county shelters, animal rescue organizations and other groups assisting families with special requests. Many rescues need fosters to care for a pregnant dog or cat…or one that has just recently had their babies. They need a quiet place for mom to nurse and take care of them until they are big enough to be spayed/neutered and adopted! There are many types of fosters needed, for all kinds of dogs, cats, rabbits and more. Each organization has different guidelines with their foster program – so your best bet is to contact the various groups to determine which one is best for your situation.